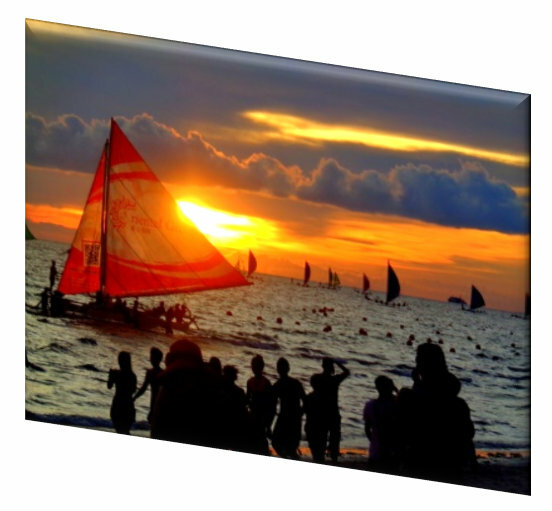 Wild Parties & All Sin Banished from Boracay Beaches? “Wild Parties & All Sin Banished from Boracay Beaches?” Well, that what it seems like to me. If you were planning to visit Boracay, formerly one of the best party beaches in the world, you might want to reconsider. A recent article in The Manila Standard may indicate officials are putting a damper on all aberrant behavior. No more wild, Ibiza-like parties, neither alcohol and cigarettes nor drugs. That’s what Tourism Secretary Bernadette Romulo-Puyat, recently announced. No mention was made of a fornication ban. The Tourism Secretary mentioned “Ibiza-like” parties in her ban. I had to “Google” that one. Ibiza is an island in the Mediterranean Sea 79 km off the coast of Valencia, Spain. Stars such as Justin Bieber, Kate Moss, Leonardo DiCaprio, Paris Hilton, Kim Kardashian and Zac Efron all party in Ibiza. In comparison, Ibiza, seen above, makes Las Vegas look like Party Central for a Jehovah’s Witness convention. We’ve visited Boracay twice in the past few years. Personally, I would LOVE to see a ban on all the annoying, pesky vendors on the beach. We could never go on the beach without being pestered by some irritating vendor trying to sell us cheap sunglasses, hats or island hopping tours every couple of minutes or so. Frankly, it really put a damper on our whole Boracay experience. Sure, I know that the sales jockeys are only trying to make a peso or two. It beats selling shabu and getting killed. That said, there has to be some kind of happy medium. Couldn’t the vendors just be confined to one area on the beach away from the shore? 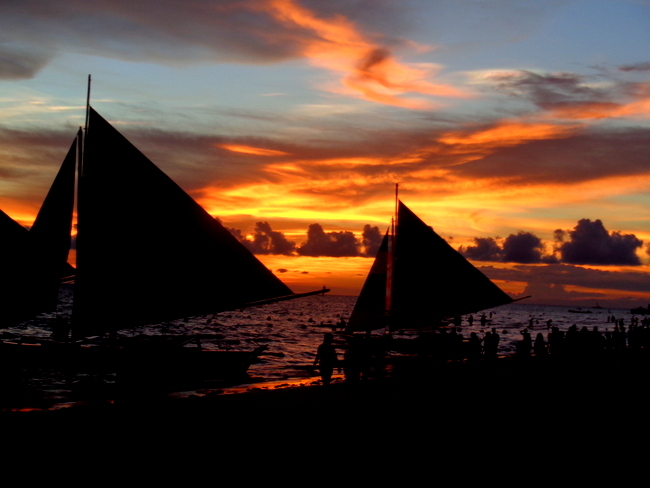 It would be great to enjoy one of Boracay’s beautiful sunsets without having to be bothered by someone trying to hustle you. Frankly, we patronize the local souvenir shops just off the beach. Plus, all the legitimate island hopping tours have their own kiosk. I don’t need someone following me and hassling me trying to push their product. Nevertheless, I’ve never been approached by anyone trying to sell me a fake I-phone which happens on Delgado Street in Iloilo City on a regular basis. In addition to the vegetation and fire dancing ban, resort owners must now put up a noise insulation in their establishments, and enforce a no-smoking zone and no-build no-party within 25+5 meters of the beachfront. Furthermore, the Department of Environment and Natural Resources is considering a ban on water sports on the island. Sinners, beware! While the smoking and alcohol ban on Boracay beaches will be instituted, neither of those prohibitions bother me. I don’t smoke. And now with the Wednesday expat group in Guimaras pretty well dissolved, I don’t even drink during the week now. The vegetation sanctions, however, puzzle me. I don’t recall seeing any vegetation on Boracay beaches during our previous visits. I don’t have anything personally against vegetation. That said, banning vegetation from the beach seems fairly extreme to me. The fire dances, however, were cool. I’m sorry to see those go. The table and chairs on the beach never bothered me, either. 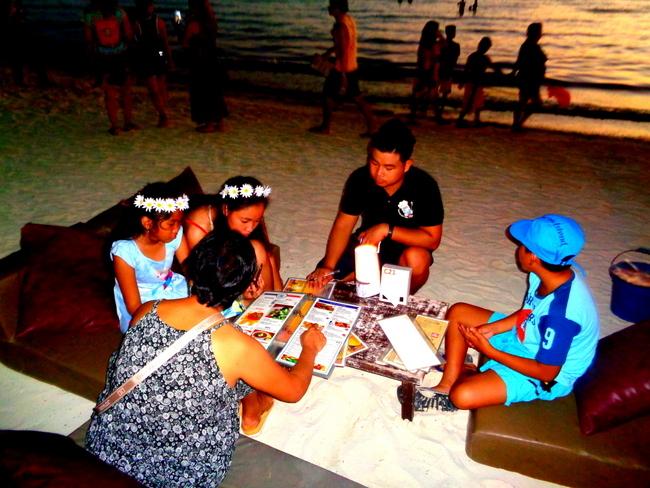 In fact, we had a delicious el fresco dinner one night at a restaurant on the beach in Boracay. Ban on parties? The Crusty Old Expat’s idea of a party is going to sleep after watching Ang Probinsyano on ABS CBN. Now that could be as late as 9:00 pm. My idea of partying on Boracay was eating a burger at Johnny Rocket’s. It’s tough getting old but it’s better than the alternative.